Tue., Aug. 2, 2016, 5:25 p.m. 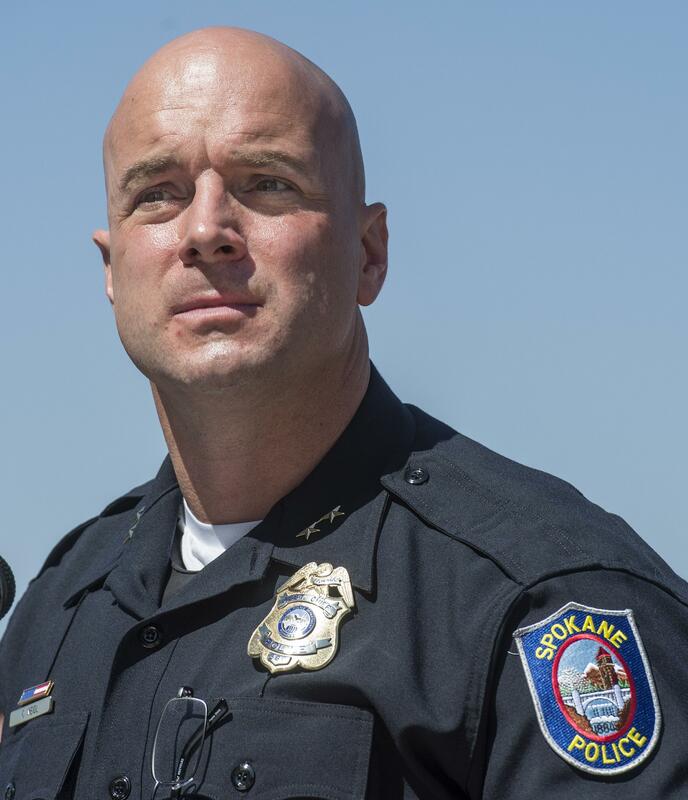 In an interview Tuesday, newly appointed Spokane police Chief Craig Meidl offered an apology to the community for saluting Karl Thompson, the officer convicted of civil rights violations in the death of Otto Zehm, as Thompson was led from a federal courtroom. Meidl also said he wants the City Council to confirm his appointment as chief. When he appointed Meidl Monday, Mayor David Condon said he would not immediately seek council confirmation, prompting outcry from some council members. Council President Ben Stuckart said council members have discussed the confirmation process among themselves and some have talked with Meidl. The council expects to have a solution reached by Thursday. “Council’s really heard a lot of concerns about process and council’s heard concerns about the municipal code being followed and we’re working on a solution that works for all of council,” he said. He said he could not elaborate about what that solution would look like. Condon’s surprise appointment of Meidl on Monday prompted pushback from some community members involved in the lengthy selection process for a new chief. Meidl did not apply for the chief’s job, repeatedly said he was not interested and was not one of the two finalists interviewed in July by panels of community leaders, police officers and other stakeholders. Mary Ann Murphy, who chaired an advisory committee that collected community feedback and gave Condon recommendations on the search process and qualifications for a new chief, and Center for Justice director Rick Eichstaedt said Monday they disagreed strongly with the decision to appoint an officer involved in the Thompson salute absent an apology. In that 2011 incident, about 50 police officers saluted Thompson in a federal courtroom as bailiffs led him away. Asked about these concerns Tuesday, Meidl first said he wanted to offer context to the salute. He spoke at length about the mood in the department after Thompson was charged and said many regular officers who were not involved in Zehm’s death felt no one was supporting them. He reiterated an explanation for the salute he offered in December when he was appointed assistant chief, saying it was an instinctive response and was intended to honor Thompson’s long history of service as a Vietnam veteran and police officer, independent of his role in Zehm’s death. “It was, in essence, our last chance that we were going to be able to see Karl Thompson before he was sent off to prison, and it was a gesture that had every intention of showing appreciation for his service, again, not a reflection on the conviction or what had occurred in this separate incident,” Meidl said. He then offered an apology and said the department has learned its lesson from the salute. Meidl said he contributed some money to Thompson’s family following the conviction to help with expenses, but never visited Thompson in prison or attended any events held by other officers in support of Thompson. He also said he plans to meet with Eichstaedt and the Center for Justice to discuss their concerns. City records provided to The Spokesman-Review after a public records request show the city has spent at least $25,000 to date on the police chief search process that began in late October when Condon first convened the Police Leadership Advisory Committee to provide input on the search process and ideal qualities for a chief. That includes $16,877 paid to Strategic Government Resources, the consulting firm that conducted the initial search for a chief and narrowed candidates to semifinalists. The firm’s contract with the city authorizes expenses of up to $25,000. The city also paid Deep Creek Consulting $5,532 for help writing the PLAC’s report to Condon. Other expenses include advertising for community forums for PLAC events, travel reimbursement and hotel expenses for committee member and Kennewick police Chief Ken Hohenberg, and hotel rooms for finalists. Several invoices, including airfare for police chief finalists to visit Spokane, have not been paid. Murphy, who chaired the PLAC, criticized Condon’s appointment Monday, saying it “slapped the community in the face” by ignoring the months of volunteer work put in by her and other community members. “As he discussed the candidates that were available with the community … there wasn’t a sense that they fit with what Spokane needed,” Coddington said, referring to the two finalists who were rejected for the job. Following his appointment Monday, Meidl said his first priorities would be providing stability in the department’s leadership structure and tying up “hanging loose ends” from the Department of Justice review of the police department. Due to vacancies created by former Chief Frank Straub’s departure and interim Chief Rick Dobrow’s retirement, a number of senior officers are serving in temporary, “out-of-grade” positions following promotions. Meidl said he intends to review those and make some permanent in the coming weeks. “We need that stability. We’ve been without a CEO for too long,” he said. He said a culture audit of the department is among the early projects he’d like to cross off the list. The city has nearly finalized an agreement with Gonzaga University to conduct the audit, which was recommended by both the Department of Justice and the Use of Force Commission. Following that, Meidl said he wants to refocus the department on what he says should be its main priority – reducing crime. Published: Aug. 2, 2016, 5:25 p.m.